I thought it would be fun to try to give a readable account of Unruh effect. It's a surprising phenomenon, and there isn't universal agreement over what exactly the theory predicts, let alone whether the effect has ever been observed. It has important implications for physics and philosophy and may even give a way to test some aspects of quantum gravity in the lab. One way to start the story is consideration of this problem: if a photon is speeding towards you, can you outrun it? Let's simplify things a bit so that we're considering motion in one dimension. If we're confined to one dimension, we can't dodge the photon, we can only hope to remain ahead of it. As the only things that can travel at the speed of light, c, are massless things like photons, it seems that there is no hope for a massive thing like a person in a spaceship to avoid it. The photon will always be faster than you, and so it'll catch you. But in theory you can outrun a photon! Do you see the flaw in the above reasoning that made it seem impossible? I've chosen units so that one second on the vertical axis is drawn the same size as one light-second on the horizontal axis. The net result is that photons always travel at 45 degree angles to the axes. Massive objects, that travel slower than light, are confined to travel on courses that have angles of smaller than 45 degrees with respect to the vertical axis. 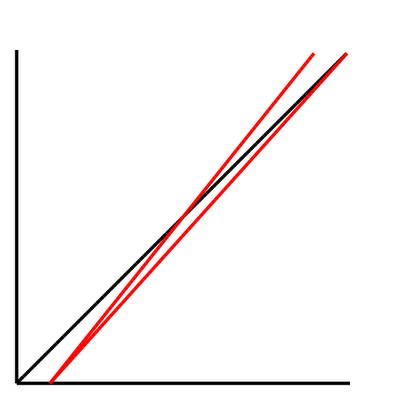 The path of the photon is the diagonal black line and the path of a spaceship is in red. It starts to the right of the photon but as we move up the time axis the photon eventually catches up with it. The faster the ship is, the further it gets before the photon catches up. But we're just putting off the inevitable. It seems that whatever we do, the photon will always catch up. At no point does the red path of the spaceship meet the black path of the photon. And yet at no point does the red path reach 45 degrees to the vertical axis. In other words, the spaceship never travels at the speed of light, and yet the photon never catches up with it. Spaceships can outrun photons! So what kind of path is that? It's actually a hyperbola and it corresponds to a spaceship accelerating at a constant rate. You might wonder how it can be constant acceleration when the speed of the spaceship never exceeds that of light. From an external observer's point of view, after a while it does look like the ship is travelling at a more or less constant velocity close to the speed of light. But from the point of view of someone on the spaceship it feels exactly like constant acceleration. So that is the path that would be taken by a spaceship with its thrusters firing at a constant rate. I chose that path so that the spaceship stays just in front of the photon. A photon that starts slightly to the right will eventually catch up with the ship. But photons starting further to the left of the ship will never reach it. This means that absolutely nothing starting to the left of the black photon path can ever catch the ship. That should sound familiar. It's exactly like a black hole. From the point of view of someone on the ship, the diagonal black line is exactly like the event horizon of a black hole. Nothing to the left of it can ever be seen by observers on the ship. Again, the black diagonal line is the path of a photon, which we know is a bit like an event horizon. The blue line is the path of an object at rest. In effect, it's falling over our apparent event horizon. Of course the blue object doesn't see any unusual phenomenon on approaching the event horizon because there's nothing really there - it's only something seen by observers in the ship. 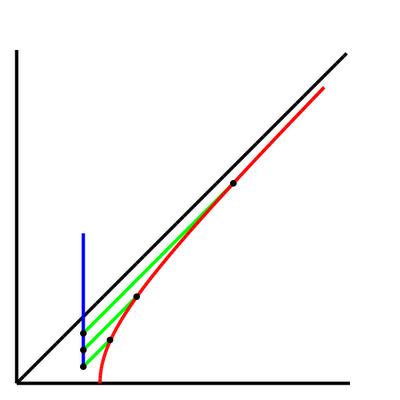 The blue object emits a series of photons (shown in green) at equal intervals. As long as these photons are emitted before the event horizon they eventually catch up with the red spaceship. But notice how they arrive at more and more widely spaced intervals. A photon released exactly at the event horizon never reaches the ship. So the viewers on the ship see the spacing between the photons get longer and longer. They'll never see the blue object cross the event horizon they'll just see it getting closer and closer until eventually it appears to freeze. Again, this is just like a black hole event horizon. The universe looks pretty weird from the point of view of a constantly accelerating observer. Half of it is simply missing behind an event horizon. But that's just the start of the weirdness. When we throw Quantum Mechanics into the mix something much weirder happens. It's well known that physicists expect black holes to emit particles as Hawking radiation. But our accelerating observer sees something like a black hole, so we might expect them to see something like Hawking radiation. We also know that an observer at rest sees no event horizon. Which means that we might predict that accelerating observers see particles that observers at rest don't. Can we take such a prediction seriously? As we follow up the time axis, pairs of (complementary coloured) particles come into existence and then annihilate each other. These events are so fleeting that they have no effect on our particle detectors and we see a vacuum. But note that I've drawn one of these events straddling our apparent event horizon. From the point of view of an accelerating observer this looks like a pair of particles coming into existence, but because of the argument I sketched above, they seem to freeze near the event horizon. In other words, to an accelerating observer these fleeting events are no longer fleeting, they look like real particles coming into existence and sticking around forever. Accelerating observers appear to see particles in a vacuum! What I've described above is absolutely not a rigourous argument. But amazingly, when you use the machinery of quantum field theory you end up making exactly the same prediction: accelerating observers see particles. This is known as the Unruh effect. When you do this properly you can compute a bit more detail. It turns out that the energies of the particles are random with exactly the same distribution as black body radiation. In other words, the vacuum looks like it has a glow corresponding to a particular temperature that is proportional to the acceleration. But it's not a bright glow. You need to accelerate at about 1020 m/s2 before the temperature appears to be 1K. Building a thermometer that can survive such accelerations is no mean feat. So it looks like the Unruh effect is a curiosity that might never be observed in the lab. But it has been suggested that the Unruh effect has already been observed. There aren't many things that can survive that kind of acceleration, but an electron can, and an electron can behave like a thermometer. Electrons in circular particle accelerators routinely undergo the kinds of accelerations we're talking about. They do so because they are driven by a magnetic field. Now an electron has spin, so you can think of it as a bit like a little electric current running round in a loop. That means an electron is like a little dipole electromagnet. Magnets in magnetic fields tend to want to line up along the field - that's how a compass works. So electrons that spend long enough in a particle accelerator, eg. those in a storage ring, should eventually line up with the field. Lining up like this is known as polarisation, and in this particular case it's known as he Sokolov Ternov effect. But when we look at electrons in a storage ring it turns out they're not quite completely lined up, they're slightly depolarised. This is easily explained by Unruh radiation - they're constantly accelerating and so they feel themselves to be in a hot environment. The continual interaction with this hot environment causes the electron spins to be a bit randomised, so they don't all line up nicely. Unfortunately this isn't definitive evidence for Unruh radiation because when we carry out the full calculation of the Sokolov-Ternov effect it turns out that it predicts partial depolarisation anyway. Now it looks like we don't have evidence for the Unruh effect. But it's not that simple. The Unruh effect isn't a new effect made up by a physicist. It's a prediction based on a new way of looking at fairly conventional physics. The Sokolov-Ternov effect is also predicted from standard physics, just in a different frame of reference. So maybe the partial depolarisation predicted by this effect is in fact the very same thing as the Unruh effect, just looked at from a different point of view. What does this mean philosophically? We're used to the idea that looking at things from different angles changes how they look. Einstein extended this notion to spacetime so space and time seem different to moving observers. The Unruh effect goes one step further. Whether or not an individual particle exists depends on your point of view. Do particles not have any kind of existence independently of how we look at them? And how does it look to an observer at rest watching an accelerating observer fly by with a thermometer. Do they see a thermometer apparently responding to nothing? Or do they also see the particles once they've interacted with a thermometer? It's all so weird that some physicists take the view that the notion of the particle is outdated and we should only be talking about quantum mechanical wavefunctions. There's another reason why the Unruh effect is important. The Unruh effect doesn't involve General Relativity, which is all about curved spacetime. But it does use the same mathematical machinery so it gives a way to test out that mathematics. So even if we don't have laboratory black holes to play with, we may still be able to investigate the mathematical framework that predicts phenomena like the Hawking effect. But also note that at least one paper claims it's all a mathematical error and there is no Unruh effect in reality. I learnt about the Unruh effect from Wald's book Quantum field theory in curved spacetime and black hole thermodynamics. The diagram showing particle creation/annihilation events straddling the event horizon came from Susskind and Lindesay's An Introduction to Black Holes, Information and the String Theory Revolution. I tried to catch up with recent developments by reading some of the paper The Unruh effect and its applications. Is there a minimum rate of acceleration required to produce this effect? I presume different rates give different asymptotes and you need one that beats 45 degrees. How does this minimum acceleration relate to the acceleration produced by a black hole at some radius? Is there some nice relationship involving the Schwarzchild radius? Every acceleration eventually results in a 45 degree angle. The speed limit of nature is the speed of light and so that speed always provides the asymptote. You can relate this to a black hole by thinking about hovering over a large black hole. Locally the gravitational field looks like a constant vector, like how on the surface of the earth we can use the vector (0,-g,0). As you hover, you feel gravity pull you down onto the floor of your spaceship. This feels exactly like accelerating at a constant rate. According to Einstein's equivalence principle, the feeling of gravitational pull is the same thing as the feeling of acceleration. And so you'd expect a constant accelerator to see the same thing as a black hole hoverer. One sees Hawking radiation (which results in a particular temperature) and so the other must see the same thing (in which case it's called the Unruh effect, and should result in the same temperature). The relevant formulae are on Wikipedia so it should be easy to see if the two approaches give the same formula. you mention thinking of things in one dimension, yet you have demonstrated the point on a 2-dimensional chart. how does something imagined in one dimension possess the capacity for 'direction'? i want to read the rest, but i'm barely stumbling atop that, waiting for the moment i lose my footing and crash into the waters of vitriolic indifference. i'm sorry for the repost, but i misspelled 'lose' as 'loose' and felt immensely stupid. I'm talking about one dimension of space and one of time. So space looks one-dimensional to people in it, but spacetime is two-dimensional. Of course this is just for simplification. In reality the theory is worked out in a 4D spacetime with three dimensions of space and one for time. oh yeah, a simplification! thanks for the clarification. i tend to think of time as being an abstract recognition of the evolution of matter rather than a concrete thing. time being a manifestation of the capacity for memory and all the prefrontal cortex's various functions. i always forget about time. This is from the wikipedia page: The Unruh effect, described in 1976 by Bill Unruh of the University of British Columbia, is the prediction that an accelerating observer will observe black-body radiation where an inertial observer would observe none. In other words, the background appears to be warm from an accelerating reference frame. Thank you for a very entertaining reading by my morning coffee! However, where are the monads? ;-) I expect your next post to contain haskell monads for relativity and quantum mechanics. You know, Feynman diagrams liberated from the chains of fortran and the like. I don't really see how the explanation in the first part could be applied to electrons in a circular accelerator. Am I correct in thinking that the acceleration is that which is required to keep them traveling in a circular path? If so, then though the magnitude of the acceleration is constant, the direction is continually changing, so the situation seems rather different than the 1-dimensional case, or a space ship firing its thrusters at a constant rate. The papers on circular accelerators discuss the difficulty of applying the theory to circular motion and at least one paper says it doesn't arise in circular motion. But for a large enough circle, the motion will look like approximately linear motion for short intervals at a time. So I'd expect the Unruh effect to look similar. Well, if you take 1 um/s^2 per metre, and apply that expansion rate to all the metres between us and the centre of the earth (6000km), you get 6m/s^2, just a little less than g. On the other hand, this effect completely outweighs the acceleration due to the sun (2e30kg, 150e9m -> 6mm/s^2 acc, Vs 1e-6 * 150e9 = 150000m/s^2 total expansion); if true therefore, the earth would fly off with the rushing expansion of space, unless if G was actually a much bigger number than previously thought - i.e. we'd have to rethink gravitation. Much easier is to assume that space just expands in the vicinity of dark energy/matter, which, fortunately, is not here. But with a big enough circle, the acceleration towards the centre of the accelerator is small and we won't see any Unruh effect. Unless there is to be very high angular acceleration to compensate. Don't we want to see very high acceleration in a constant direction, even if only for a short time? A big circle and high acceleration! 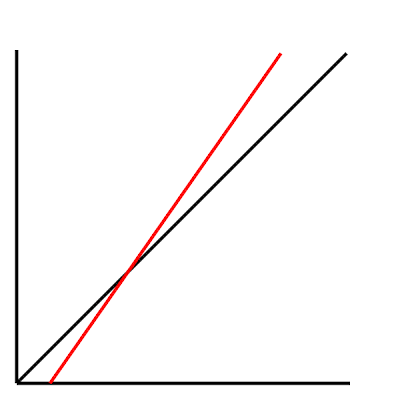 BTW I'm not implying that you require constant acceleration for the Unruh effect to appear. I'm saying that if you want to use the linear acceleration formula with confidence to predict the amount of Unruh effect from circular acceleration you want approximately constant acceleration for reasonably long periods of time. There's another calculation you could carry out specifically for circular motion - but it'll be more difficult. Similarly I sketched out what happens for constant acceleration for all time but you could also do the calculation for something that starts at rest, accelerates for a bit, and then remains at a constant velocity. Again, it's much harder to work out the details, but you still expect to see the effect. When I said "we won't see any Unruh effect" I meant to say that it might be just as hard to see in a big ring as in a small one, not that the Unruh effect disappears altogether. For a given speed, say 90% of c, an increased radius will make the acceleration more like linear acceleration, but the magnitude of the acceleration must be smaller. This is a really silly question but is there any particular reason you put time on the vertical axis instead of the more conventional horizontal axis? I don't think josefs question is silly. It's common practice and makes more sense to see position as a function of time (f(x) = y). And how can the acceleration be constant if the velocity never get's greater than c. Youre diagram shows that the accelelration decreases infinetly approaching zero. I don't see how this would be significantly diffrent from a spacehip moving at constant velocity very close to the speed of light. So my question is: What is the relevance of acceleration to observing this unruh effect, other than acceleration is required to reach velocities close to the speed of light? Yes, that's right! I completly overlooked the fact that velocities aproaching c distort the very basic stuff like mass, time and lenght. It makes perfect sense to me now. I sincerely apologize for posting stupid questions like that. Aha! Finally something on your blog that I understand! There is also an entirely classical way to view the Unruh effect: Doppler shift. Imagine you are accelerating into a wave of fixed frequency; due to Doppler shift, you will see it at all sorts of different frequencies. If you do the maths (a Fourier transform) and average over all frequencies, you recover the Planck distribution for a field at the Unruh temperature. If you're familiar with the QFT formalism, then you're simply taking the Fourier transform of the correlation function along the desired trajectory. A quick plug: my own work has been focussed on whether it's possible to see the Unruh effect in atomic Bose-Einstein condensates. We are hoping to move a detector (atom in various electronic states) in a circle in a BEC. The phonons in the BEC act as a quantum vacuum, and should give rise to an analogous effect. Hopefully in the next couple of years we can get some experimental groups to really take a crack at this. I was thinking of giving an account based on FFTs but I wanted to try to get some talk of creation and annihilation operators in there and couldn't figure out a "pop science" explanation of them. Good look on the BEC experiments. I seem to remember reading about something similar with researchers looking for Hawking radiation near a BEC "event horizon". "But for a large enough circle, the motion will look like approximately linear motion for short intervals at a time"
But then, if you are approximating the circular motion as a linear one, don't you lose all the acceleration there? Because by definition, the only acceleration in a circular motion is the change of direction. Once you lose that and assume linear motion, you're just travelling in constant velocity, isn't it so? Sundar, what you are thinking of is constant circular motion, with no angular acceleration. Electrons in a particle accelerator certainly have acceleration in the direction of motion (this just requires a greater force to maintain the circular path). At least, I think that's what you were talking about. If the discussion is constant circular motion, then shouldn't the false centrifugal force provide constant acceleration? However, we do have the problem with our light-beam analysis (light wouldn't travel with the circle). This might not be a problem though, if we let the centripetal force be gravitational, the orbit keep the spaceship from falling (instead of thrusters), and just consider light as radiating from the center. I don't know if I understood this anywhere close to correctly. It would be interesting while thinking of a proton as a singularity. To produce controllable black holes that can be manipulated to travel in a direction we choose. The next part is building a ship that can safely orbit said miniature black hole and manipulate its direction. Adding this to my to do list. I believe that you are mistaken. The photon would only appear to never catch the ship from the reference frame of whatever the ship is accelerating with respect to. From the reference frame of the ship, the photon would still appear to approach at the speed of light and pass the ship. That's just how fast light travels. There is the world-line of the photon and the world-line of the spaceship. The question is: do these ever intersect? The answer to this question is independent of reference frame. Things like distance, mass and direction are all measured with respect to a reference frame. But whether or not two world-lines meet doesn't change when you change reference frame. 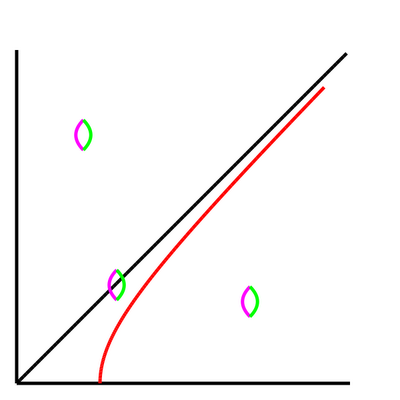 If two curves meet in one reference frame, they meet in all reference frames, and vice versa. The world-lines of the photon and the spaceship never meet. Suppose that the photon is the front of an expanding shell of deadly radiation. You could use constant acceleration to outrun this shell and stay alive. 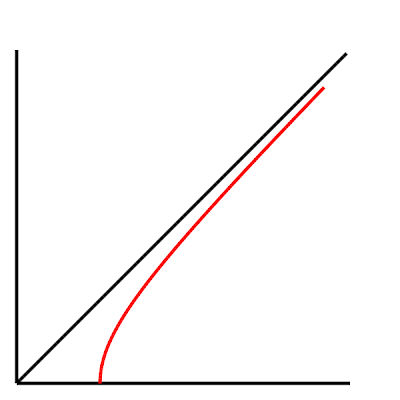 But there might be a catch: it might be that the proper time of the hyperbolic curve you follow is finite. Ie. even though you outrun the photon, you only get to experience a finite amount of life. However, it turns out that the proper length of a hyperbola goes to infinity as you travel along the curve. So not only can you outrun the photon, you can do so for what feels like forever in your own frame of reference. Take a look here for some technical details. The proper time (ie. the time you experience) remains finite along the full length of the hyperbola. What I just said is a bit misleading. If someone falls into a black hole, people outside never *see* the "victim" cross the event horizon because they will never receive photons emitted as the victim crosses over. It's debatable whether this should be described as "from the reference frame of people outside, the victim never crosses the event horizon". Nonetheless, that's not the situation that applies here. In the black hole case, the victim crosses the event horizon at a finite proper time. In the case here, there is no proper time for people on the spaceship at which they perceive the photon catching up with themselves. My understanding is that you'd need an infinite amount of energy to create the force needed continually accelerate any craft mass to the speed of light in order to match the speed of the intrinsically massless photon in order to stay ahead of it long enough that your finite lifetime in the craft ended. You're not really outrunning the photon, because you're not going faster than it - instead you're keeping it at a steady state arms length. Hubble tells us our universe is accelerating, and that we may be that craft though... but doesn't tell us what exactly this accelerating force is. What the force people call dark energy is. Some think it's eternal inflation, others Einstein's cosmological constant, others yet again have labeled it quantum gravity, or now the latest fad everyone loves to call the entropic force.